To check your current level progress, tap on the Achievements button at the top of the main screen. This will show how much XP you have and how much you need. You can also tap Leaderboardsto see how you stack up against your friends! 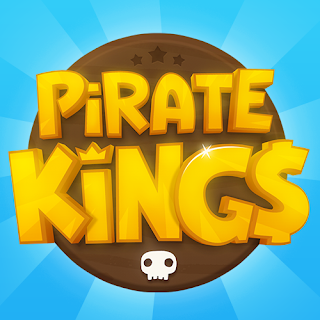 Knowing that you need to beat your opponent’s score is one thing, getting the most out of your score is another! The scorecard is broken down into two major sections, known as the Upper and Lower sections. Each combination equals the total number of dice that match that number. For example, if a player were to roll three twos, the score would be recorded as 6 in the Twos box. If a player scores at least 63 points across all of the Upper Section combinations ( Without a 5 Of a Kind Bonus), a bonus of 35 points will be added to the Upper Section Score. Lower section spaces are typically more complex and have more specific requirements for scoring. For a complete breakdown of each space, please look below! Any combination of dice can be scored in chance. There are no specific requirements for this space. Simply add up your entire roll! 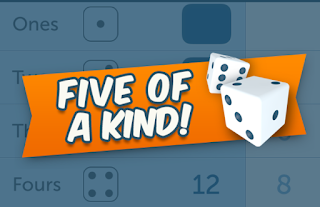 If you fill the five of a kind space and claim your 50 points, any subsequent five of a kind that you roll will award 50 bonus points to whatever space you place the second five of a kind into! This keeps five of a kinds important and very valuable for the entire game, even if you’ve already scored one! Daily Gift - Every day, your Facebook friends can send you a single bonus roll. They add up quick, so be sure to collect your Daily Gift every day! A bonus roll is a terrible thing to waste, and we want you to have it. Please keep in mind that you can only accept one bonus roll per day. If you accept more than one per day, it won’t be added to your account. Custom dice are only available for players on iOS/Android phones and tablets. Custom dice are new colors and styles for the dice that you see while you play the game. Your opponents will see the custom dice that you're using at the top of their screen once you take your turn. Where do I find the custom dice page? You can access this new feature by pressing the "Awards" button at the top of the main screen for Dice With Buddies. iOS Players: Once you're on the awards screen, swipe right on the navigation bar at the top of the page to switch to the "Custom Dice" tab from the "Achievements" tab. Android Players : Once you're on the awards screen, swipe left on the screen to switch tabs until you reach the "Custom Dice" tab. How do I choose a new dice? Any custom dice that you own will be shown under the "Your Dice Collection" section. The current Dice that you're using is highlighted in blue and shows the word "Active". You can switch to using any other dice in the "Your Dice Collection" section by pressing on the dice you wish to choose and then pressing "Activate". How do I unlock new dice? All currently available custom dice are shown in the "Locked Dice" section. Each custom dice you can unlock has an achievement that you must earn to unlock it. If you press on any of those locked custom dice, the window which opens will tell you exactly what you need to do to unlock it, and even show your current progress towards that goal. 1. Several custom dice do not track progress retroactively. Many custom dice only track progress that you've made after the release of custom dice. Here's all of the custom dice that fall under this rule: St. Paddy's, Gold, Leopard, Diamond, Tally, Orange . 2. The progress bar on Gold, Orange, Roman Numeral, and Wood dice does not actively track your streak. The progress bar for these two custom dice only show the highest point in your streak that you have ever reached, which means that it's possible for them to appear "stuck" if you lose your streak. Example: if you play for 20 consecutive days and then miss a day, the Orange dice progress bar will show 20 until you build up to a streak longer than 20. 3. The 24 hour window on Gold dice is always moving forward with you. Rather than being set at a fixed time, such as midnight one day to midnight the next day, this achievement continuously checks the previous 24 hours and counts the amount of bonus rolls spent in that time frame. Tournaments run daily, and often times two will be running simultaneously! While scheduling sometimes varies by an hour or two, typically tournaments will start at 12:00AM PST, and then end at 11:59PM PST. This means there’s just shy of 24 hours for each and every tournament that runs. Getting into a tournament is easy ! All you have to do is click on the Tournament button at the top of the screen. This will show you any tournaments currently running, at which point you can press the “enter now” button to play. There’s no limit on the number of times you can enter a tournament. For most tournaments, your first entry is free. After that, there is typically a bonus roll buy-in that you have to pay before you can re-enter. The “enter now” button should always list the amount of bonus rolls it will cost to enter. Some tournaments, called freerolls, have no buy-in cost and you can play as many times as you like. Grand Prize - 1st place only! The Winner’s Circle usually falls between 2nd place and 30th place. Sometimes it might be smaller or larger! Honorable Mentions come after the Winner’s Circle, and typically have hundreds or thousands of slots! You can always find the placing requirements and rewards for each tier by pressing the “Info” button in the top left corner of the tournament page. At the bottom of the “Your Turn” section you will see a Match of the Day shown which prompts you to play against an opponent for a reward of XP. If you choose to start the Match of the Day, then you will receive the XP as soon as your opponent accepts the game. Once started, a new Match of the Day won’t be shown until a day has passed. Note: This feature has taken the place of our previous “Suggested Game” feature, which functioned in a similar manner, but did not offer XP. Whenever you earn prizes from tournaments, they'll arrive on the Prizes page with a ""Claim"" button by each prize! If the ""Prizes"" section is not visible, then you don't have any prizes to claim. Scratchers, Daily Achievements, and Dice Master Showdown rewards will still all automatically be credited to you. You don't have to go and claim them from the Rewards section! The event lobby was introduced with version 4.5 of the game. If you aren't on version 4.5 yet, you'll need to update, or wait until an update is available before you'll be able to utilize this feature. What is the Event Lobby? The event lobby is a new page created to house all of our special events and challenges in one location so that you can more easily keep track of everything going on in the world of Yahtzee with Buddies! The event lobby also contains your prizes from events such as tournaments. Keep in mind you will need to manually claim those prizes now! If you want to learn more, please check out the "Event Lobby Standings Page" article. How do I find the Event Lobby? A button for entering the event lobby page should be located about the "Your Turn" section, right near the top of the game's main menu. What's on the Event Lobby page? These banners, located at the top of the Event Lobby, serve as highlights for events that we want to call out special attention to. Our new Dice Master Showdown feature will show up both here in the Event Lobby, and in the "Your Turn" section of the main menu. If you press the "Play" button, you'll be taken right into a game against a master! If you press on the main body of this button, you'll be taken to the Dice Master Showdown page. 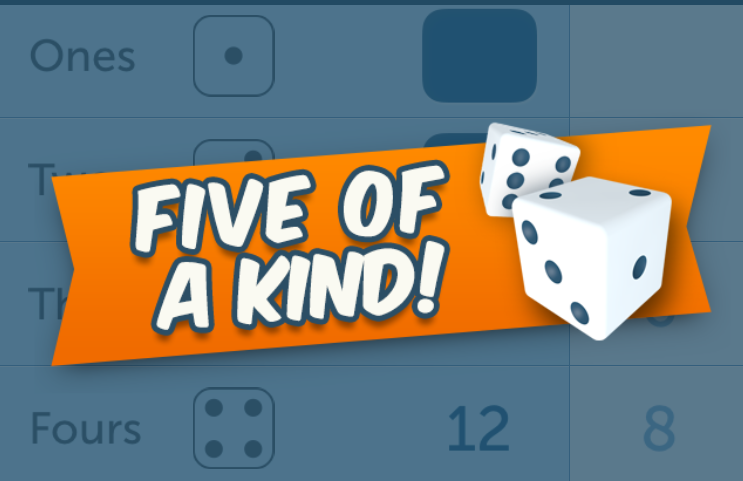 You'll see a custom dice that you haven't yet unlocked in this section, just in case you weren't aware of a new custom dice, or to remind you about any custom dice you might have forgotten. Your daily achievement will be listed here, making it easier to check on and notice! Don't miss out on those bonus rolls. Events will vary, but you should expect to see sales, special offers, and other unique events that you don't see every day! Dice Duels is a new game type available through the Event Lobby which allows players to compete in a monthly league that awards special prizes. 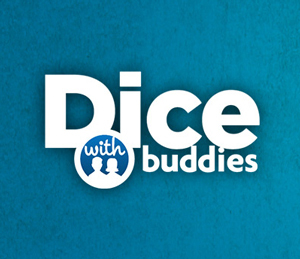 Your first Dice Duel of the day is free to enter while subsequent entries cost diamonds. Once you’ve chosen to enter, you’ll be matched up against an opponent who has also chosen to duel. Dice Duels have a 12 hour forfeit timer instead of the typical 5-7 day forfeit timer. Make sure to pay attention to your duels once you’ve started them! Winning a Dice Duel will give you a few diamonds, while accumulating wins will unlock increasingly better rewards of bonus rolls and XP. You can view your progress towards these rewards on the Dice Duels prizes page. Most leagues will include two unique frames and the details of how to unlock these frames will always be shown on the main Dice Duels screen. Diamonds serve as a new currency that you can earn or buy in game! Your total Diamonds are shown at the top of the game’s main screen, alongside bonus rolls. You can find Diamonds you have been rewarded in Events + Rewards and swipe right to the next screen to claim! What does the green dot by a players name mean?